This CD is for everyone who desires to create a balanced inner atmosphere: doctors, psychologists, massage therapists, those seeking relaxation during radio therapy, sleeplessness, homework, Yoga, Tai Chi, Reiki and meditation. 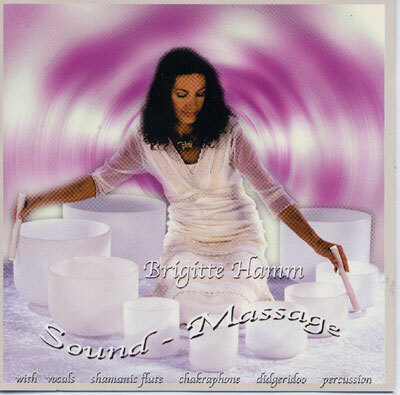 The celestial vibrations of the crystal bowls played by Brigitte Hamm are in harmony with the voice of Annette Reich. Her celestial tones will uplift you to higher vibrations bringing harmony to your soul. The sounds of Joga Dass' chakraphone instruments have a 13 note scale of pure intervals based on 8 Hz, corresponding to the 13 "Tones of Creation" of the Mayan Calendar. This scale is therefore, in harmony with nature and with the human energy centres. The resonance of these vibrations will be felt very deeply in your body. Kailash entices special sounds most wondrously from his shamanic flute and the didgeridoo. He shows us the way to feelings of profound love for Mother Earth. Single sounds and chanting travel from left to right and back in the stereoscopic image in order to stimulate and balance the vibration in the brain and pineal gland. Using headphones will enhance this effect.